Discussion in 'Dovetail Live Article Discussion' started by TrainSim-James, Aug 2, 2018. At long last. Try keeping it as bug-less as possible (which in it of itself, is a feat yet to be seen with DTG content). Still, looking forward to it. Secured mine today, can't wait for Aug 16 to come now. Stunning news! Stunning news indeed! Looking forward to operating these trains' controls! Wait why does the sky look so much better? Is this just some editing or did you actually rework the sky? Is that a in-game screenshot with new sky added or photoshopped? Does anybody know something about it? Or maybe about a walkable BR 185.2 engine room? Thank goodness -- I ran and enjoyed the last of the NEC freight sessions yesterday. With both freight and passenger scenarios/services, this has to be better than the previous German route. Unlike some folks, I can wait, but am happy to see and take advantage of this pre-release discount. Could we please get a wallpaper version of that main artwork? I know some people will like to get angry that it's 'misleading' but dang it looks good. I'd love to have a 4K version of that on my desktop. I spent £24.99 on Rapid Transit. The signalling system doesn't work correctly and DTG have decided to take my money in bad faith and use it to create more DLC, rather than using it to make right the existing product, which I paid a lot of money for. I foolishly thought that helping to fund the development of the next generation of train simulator would be a great thing to do. 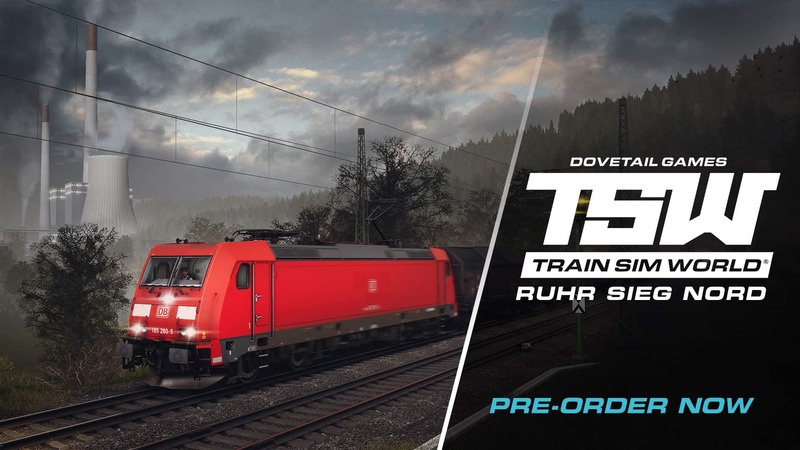 Now I just feel that DTG have used my passion, excitement and enthusiasm for train simming to rip me off. I will not be buying RSN until the PZB faults have been corrected with RT. I do have to ask, it says "initially on Windows PC", so does that mean it will eventually come to console? Yes. RSN, as well as WSR, are both coming to TSW, over on consoles. At a later date according to DTG, but definitely coming. I don't know if this is the right place here, but I noticed that the headlights for the cabcar are wrong. The white and red lights are both always on the outer lights. I guess they did the lights right but drive with high beams, same with the Talent 2 on RT, the right light setting was listed as markers and the "normal" light settings was always the highbeams so you couldnt see anything when driving with the normal markers. Also on the 143 the bogie seems to be a bit misplaced. Other than that it looks like a solid DLC, looking forward to it. Is it possible to see some video footage of the route before pre-ordering, preferably as a live stream? They usually stream it the day before the release or something along those lines. As much as I like the screenshots and Dosto cars I'll probably wait to see what is this all about. To see if there's any improvements in some areas. Sooooo I assume DTG gave up on communicating with their community? Or do they expect us to do something special to get our questions answered? No working destination display on the double-deck coach I presume? Looks realy amazing so far and will definitely pre-order it. The br 143 has cone out great! The coupler in the cabcar is hooked in correctly as seen in latest screenshots. -Pantograph of 143 doesnt touch the overhead wire in 1 screenshot. -Fix the lights on the cabcar, the outer ones are used for red and yellow lamps. Inner ones are for highbeam. The "fine print" at the bottom of the release announcement reads (as always), "Screenshots and images displayed in this article may depict content that is still in development." In Train Simulator 2018, there were also present DB Class 294 and DB Class V200 diesel. Although not that great because of the simulation limitations in TS2018 will they be re-introduced with the DLC or as an additional DLC in the future? They don't talk about their future plans further than the next announced DLC in detail. The DB Class 294 could be introduced fairly easily, the V200 would need a route set in the 80s or earlier. Hello! When we will see gameplay? Nice, amazing video, I literally cant wait anymore. As seen in the video, lights on the dosto are fixed and as far as I can see the couplers are hooked in as they should, nice work!!! Looks amazong! I can hardly wait for Thursday! The trailer is very impressive! Empty destination displays on trains are a bit sad though. yes! I pre-ordered today and the new trailer looks amazing (with some odd parts). Just a few days until release, this DLC looks like a good one! I hope that this release will upset the apple-cart of your pessimistic soul. which techniques DoveTail uses to establish all the real–looking buildings, bridges etc. along this route. Not only on this route, but on all other TSW routes. I cannot conceive that they model everything on their own. Do they perhaps use Google Maps, OpenStreetMap or other staff to get those buildings etc ? which techniques DoveTail use to establish all the real–looking buildings, bridges etc. along this route. Not only on this route, but on all other TSW routes. I cannot conceice that they model everything on their own. Do they perhaps use Google Maps, OpenStreetMap or other staff to get those buildings etc ?